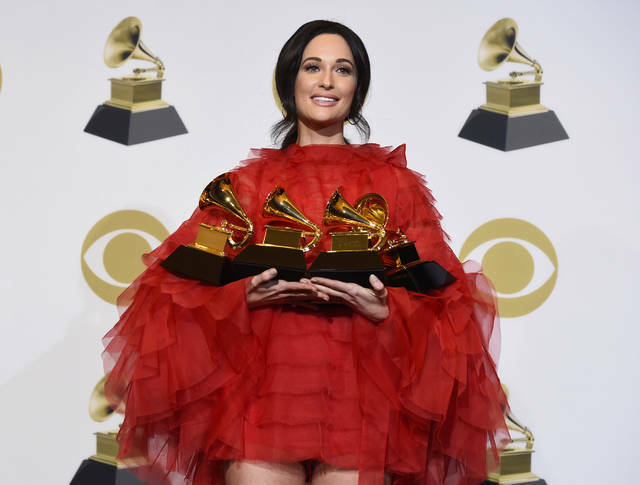 Kacey Musgraves made history when she won the 2019 Grammy for album of the year and swept the country music categories, but there’s one award she won’t win: entertainer of the year at the Academy of Country Music Awards. That’s because no women were nominated for the show’s top award Sunday. Instead, men make up the nominees exclusively for a second straight year — Chris Stapleton, Keith Urban, Kenny Chesney, Luke Bryan and Jason Aldean, who has held the title since 2015, will compete for the prize. Reba McEntire, who is hosting the show at the MGM Grand Garden Arena in Las Vegas, said it is disappointing that a female act isn’t in contention for the coveted ACM award. Musgraves is the sole female artist in the album of the year category at the ACM Awards. Her competition includes Stapleton’s “From A Room: Volume 2,” Eric Church’s “Desperate Man,” Dierks Bentley’s “The Mountain” and Dan + Shay’s self-titled release. Bebe Rexha was the only woman competing for song of the year thanks to the record-setting hit “Meant to Be,” featuring Florida Georgia Line, while Maddie & Tae was the sole female act up for duo of the year. No women were nominated for songwriter of the year. Luckily the performers at ACM Awards include a good number of female musicians. Underwood, Brandi Carlile, Maren Morris, Kelly Clarkson, Miranda Lambert, Ashley McBryde and McEntire saing onstage. “This Is Us” actress Chrissy Metz, who stars in the new movie “Breakthrough,” performed a song alongside Lauren Alaina, Mickey Guyton, Maddie & Tae and Underwood. Others set to perform Sunday included Blake Shelton, George Strait, Brooks & Dunn, Kane Brown, Luke Combs, Florida Georgia Line, Khalid, Little Big Town and Thomas Rhett.